I tested an adaption of a lovely red lentil soup from the new Plenty More by the inimitable Yotam Ottolenghi (recipe will go up on the Seasonal Recipe Collection soon) but that undertaking left me with about 1/2 cup of leftover coconut milk. I’ve had leftover coconut milk go bad on me before. 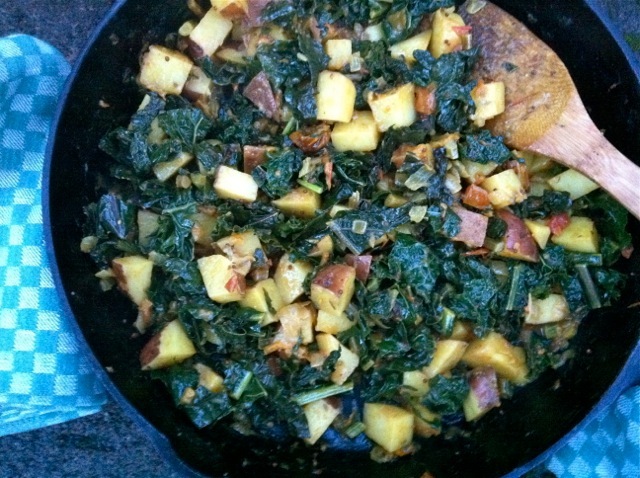 To avoid that I made this simple braise with cumin and mustard seeds, a bit of turmeric and ground cumin, potatoes, kale, said coconut milk and a handful of chopped roasted tomatoes. Paired with warm cornbread and a radicchio, beet, parsley and walnut salad it was a typically random dinner in this household. I may well make this combination again and might even devote more than 1/3 of can of coconut milk to it to make it saucier and serve it with naan or rice or some such. You can play with the spices here. . . add ginger and/or garlic if you want. Add coriander or hot peppers of some kind. .. use other root vegetables or other greens. . . you get the point! Heat the oil in a large, heavy skillet. Add the onion and cook for about 5 minutes over medium-high heat. Add the spices and salt and cook for another minute or two, stirring constantly. Add the potatoes and tomatoes and cook for 5 minutes. Then add the kale, coconut milk and water. Bring everything to a simmer, turn down and cover and cook, stirring occasionally for about 10 minutes, adding a bit of water, more coconut milk or juice from canned tomatoes if things dry out too much) or until the potatoes and kale are tender. Taste and adjust seasoning with salt. Well, I think it sounds mighty fine and I imagine one could substitute broth for the coconut milk if one had to and it still might be delish. I have some garden rabbit broth in the freezer that needs using. Exactly!Hmm, … Garden rabbit broth. ..
Made this for dinner tonight as a side dish for steaks. Super yummy! Plus, I feel great not letting my leftover coconut milk go to waste. Thanks for sharing! This is great. I love the combo with tomato. I’ve always added leftover to a smoothie. But this is way more interesting. I’ve been cutting out dairy in an attempt to let my tendonitis heal (I understand dairy is inflammatory), so I’ve been using coconut milk in my coffee. It make such a great replacement, I might not go back to cream!